As everyone knows by now Louisiana had two fantastic snow days Thursday and Friday. Unlike our neighbors in the north who have seen far too much of the stuff we never get to see snow! Thursday we watched it come down and marveled at the beauty of it. 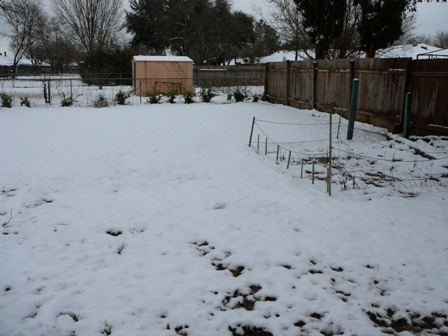 We hoped that it would stick around long enough for us to get to play in it. 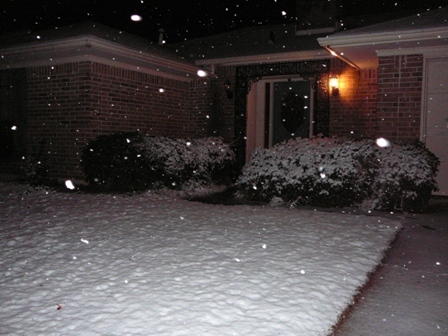 By Thursday night it was sticking and Friday morning we got up to a beautiful blanket covering our world. I’ve seen many pictures of very creative snowmen that were made Friday but I didn’t make one. My german shepard had seen snow when he was a puppy back in New Mexico in 2006 but he seemed to have forgotten all about it and appeared to have no idea what this cold, white stuff was when I took him out to play in it. 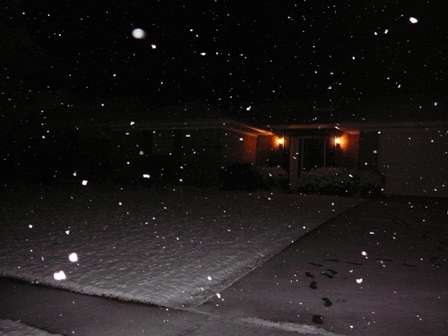 First he walked along the edge of the screened in porch where the overhang had kept the snow from hitting the ground. Finally I enticed him out into the yard to play with me. It was fun! As I threw a snowball he leaped up to catch it as he does with his frizby. His expression as the cold saturated his tongue was priceless. He would quickly drop the snowball. Although he was surrounded by snow he would nose around until he found the ball with my scent on it and try to pick it up. Soon he came to me where I was making the snowballs and would bite at the snow in my hand destroying the snowball before I could compact it. We ran and we played and we had a wonderful time as the snow quickly melted. Later in the afternoon when I went out with him again the snow was pretty much gone. He’d go to the edge of the shed where the overhang had kept the snow from melting yet and look back at me like, “Come on Mom; we’ve still got a little bit!” I hope it’s not so long that he totally forgets the fun we had before we see snow again!